BOSTON (AP) Anthony Davis and the New Orleans Pelicans eventually were too big for the Boston Celtics. 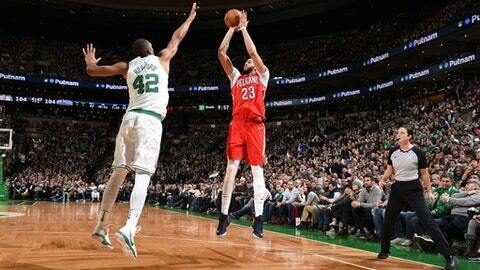 Davis had 45 points and 16 rebounds as he and DeMarcus Cousins controlled the lane and led the Pelicans to a 116-113 overtime victory on Tuesday night, ending the Celtics’ seven-game winning streak. ”It was a great win for us. They tested us,” said Davis, who just missed matching the 48 points he scored Sunday during a win in New York. Cousins added 19 points and 15 rebounds, and Jrue Holiday scored 23 points. The trio combined for all 12 Pelicans points in OT as New Orleans handed the Celtics their first loss of 2018. Ian Clark added 15 points for the Pelicans, whose size inside ended up prevailing in overtime when Boston’s barrage of 3-pointers stopped falling. Kyrie Irving led Boston with 27 points, 24 after halftime as the Celtics rallied from a 12-point deficit and led by as much as five late in regulation. Marcus Smart and Jaylen Brown added 16 points apiece for the Celtics, who attempted a season-high 50 3-pointers. Rather than challenge Davis and Cousins inside, the Celtics lived outside and it cost them in overtime when they went just 1 for 4. Horford’s 3-pointer early in OT gave Boston a 107-106 lead and Boston went up 113-110. A jumper by Cousins cut the lead to 113-112, then Holiday added two more field goals and Boston couldn’t catch up from there. ”They kept worrying about me so much diving to the rim, Jrue was able to hit them little midrange jumpers. He kind of took over that overtime for us and got some separation for us,” Davis said. New Orleans survived a rough start to the fourth, opening the period 3 for 13 and going without a field goal from 6:40 remained until the 1:50-mark, when a layup by Clark cut Boston’s lead to 101-98. The Pelicans went ahead 104-102 in the final minute of regulation before Irving drove for a layup to tie it at 104-all with 11 seconds left. Irving scored 16 in the third to help Boston back into it, but New Orleans scored the last six points of the third for an 87-80 lead, and went ahead by 10 early in the fourth. Boston battled back again, tying it at 95-all when a dunk by Brown invigorated the home fans. The Pelicans overcame Boston’s five-point lead late despite a rough fourth quarter for Davis, who was 0 for 3 from the floor and scored only four points in the period. Pelicans: Davis was warmly greeted by Celtics fans. He had 25 points at halftime. Celtics: The Celtics were playing their first game since returning from London, where they beat the Philadelphia 76ers 114-103 on Thursday. … Boston shot just 35 percent (18 for 51) in the first half. … Boston’s previous high for 3-pointers attempted was 43 against Atlanta on Nov. 18. The Celtics announced during the game that Hall of Famer Jo Jo White, a two-time NBA champion with Boston, had died at age 71. Boston coach Brad Stevens said White was always ”super kind” during what little time he got to spend with the two-time NBA champion, whose No. 10 was retired in 1982. Pelicans: Visit Atlanta on Wednesday night. Celtics: Host Philadelphia on Thursday night.